By Tommy Greene – openDemocracy: The effects of the 2012 Health and Social Care Act are now too disastrous to ignore. 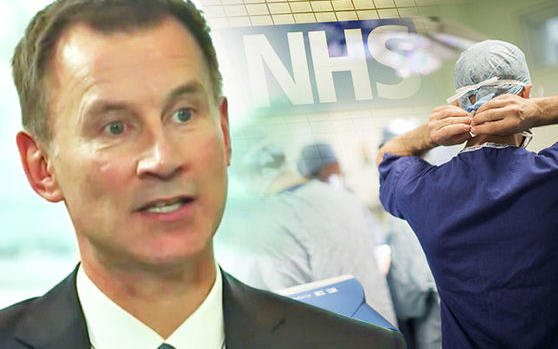 But Jeremy Hunt’s shift is of rhetoric, not of substance – and his new “ACO” plans are so dangerous, campaigners this week challenged them in the High Court. The leader of the Opposition’s opening gambit in PMQs this week was to put Theresa May on the spot over how much of NHS services were currently being outsourced to the private sector. Rather predictably, she had no answer of substance to this question. Most people are aware by now that the NHS is at breaking point. But what much of the public are still in the dark about is exactly how this crisis is happening or being navigated. Anyone wanting to find out would be well-advised to take a look at incoming Accountable Care Organisations, which threaten to usher in an ‘Americanisation’ of services and possibly the largest vehicle for future privatisation in the NHS’s history. This week, the High Court heard about the impending introduction of these ACOs from a team of 4 senior health professionals (previously 5, until the death of the late Professor Stephen Hawking in March). This judicial review looks to ensure that a shake-up as large as this does not occur without the proper public consultation and parliamentary scrutiny such a significant restructuring of public healthcare should entail. Along with legislative efforts to reinstate statutory responsibility for the health of people across England – which was essentially torn away by Andrew Lansley in 2012 – the case forms part of a several-year-long campaign to restore public healthcare (as set out in the NHS’s founding charter) as well as to uncover what transatlantic interests have planned for it. What are ACOs? And why are they such cause for concern? Already piloted quietly across 10 areas in England, Accountable Care Organisations boil down to a large-scale reorganisation and ‘integration’ of care providers. In theory, ACOs could be owned by NHS hospitals or GPs. But there may be nothing in place to stop them from being controlled by large insurance companies, finance and property firms who could eventually take them over and run them purely for profit. Through these new integrated care systems, the government looks to pool health and social care budgets from NHS England, Clinical Commissioning Groups (CCGs) and General Practice with local authority budgets into contracts to be awarded on a per capita basis. This means that ACOs could be a financial “Special Purpose Vehicle”, a public body or a private company. The longer-term upshot may be that CCGs disappear altogether and ACOs take on commissioning responsibilities, presenting them with the power to alter resources and patient composition. One central concern that has been raised relates to the way ACOs appear to blur the lines between the definition of care that’s ‘free at point of use’, care that’s charged at point of use and care that’s sold off privately. This obviously goes straight to the heart of the NHS’s founding principle of universal public healthcare provision. It is also a partial carry-over from NHS England chief Simon Stevens’ nebulous promise to “dissolve the classic divide[s]” of healthcare in his 2014 Five Year Forward View, which at the same time pledged to reduce tens of billions in expenditure before 2021. During the last two years, some of the largest ever contracts for NHS services have emerged. One of the first of these super contracts was in Dudley, where financial details of the 15-year Multispecialty Community Provider (MCP) agreement are not known. Then, in April 2017, a Manchester commissioning group announced the largest ever tender for NHS services, in a contract worth £6 billion, for a provider of all out-of-hospital care in an area serving around 600,000 patients. Last year was also the advent of the first “voluntary” contractsto be awarded to GPs and Trusts now operating as tender-based, unofficially pro-profit businesses. In February this year, a High Court judge temporarily blocked Lancashire County Council’s attempt to outsource a £104 million childcare contract to Virgin. This ruling came only weeks after NHS bodies were forced to make an undisclosed settlement to the health branch of Richard Branson’s conglomerate over its loss of a £82 million contract to provide children’s health services across Surrey. ACOs could open the door to a great deal more private US equity firms looking to prise open the £120 billion oyster of UK healthcare. Fears of backdoor privatisation have been compounded by indications from an increasingly embattled May desperately scrambling to secure a future trade deal with the US post-Brexit. Despite talk of unification, “seamless” integration and the government’s persistent use of ‘local’ areas and populations in its language around ACOs, they will almost certainly fragment, outsource and create an increasingly complex commercial model of healthcare – instead of an open, transparent, directly-accountable model of provision. ‘Accountable care’ couldn’t be any more of a misnomer. ACOs’ taxonomy of “local health systems”, each with their own geographic “footprints”, was inherited from the division of local healthcare in England under Sustainability and Transformation Plans (STPs), Stevens’ last grand solution to plug a £22 billion annual funding gap before this latest move. A core problem with STPs was its delegation of responsibilities to the[se] new ‘localities’, with no clear statutory rules or external regulation governing the care provision process. This question is one that has not become any clearer during the introduction of ACOs, for all the government’s talk of openness and liability. Jeremy Hunt’s visions of a tech panacea have also been part of the push towards ACOs, as well as to square various circles left by Stevens’ glib tract[s]. Meanwhile, underfunding of basic IT facilities in hospitals has continued – as was made all too clear in last year’s WannaCry ransomware attack[s]. Government officials maintain that ACOs are not a move towards US-style privatisation, accusing campaigners of generating “pernicious falsehood[s]” and “irresponsible” alarmism, while insisting the plans “are simply about making care more joined-up between different health and care organisations”. The pro-market King’s Fund has reiterated this message, arguing that identifications with US healthcare are mistaken and that the NHS needs more integrated care to survive. But, as health economist Allyson Pollock has pointed out, commercial contracting and subcontracting in the NHS is already happening on a scale and at a duration never considered by the 2012 Health and Social Care Act. This was one of a number of crucial concerns which either weren’t raised or were stamped out during the legislation’s passage through parliament. It’s little surprise, then, that government and pro-market bodies are trying to keep campaigners quiet about ACOs (as they did around the time of Lansley’s reforms) especially given these bodies’ cosy ties with US private health. Although May deflected Corbyn’s outsourcing question at this week’s PMQs, Allyson Pollock argues that only 36% of healthcare contracts were won by NHS providers in the financial year 2016-17, compared to 60% in 2014-15. And we also know private providers won £3.1 billion of new contracts in 2016-17, 43% of total advertised value. If anything, ACOs form part of a discursive shift rather than a shift from policy’s direction of travel after the effects of the disastrous 2012 Act became too obvious to ignore – and then needed to be ‘tidied up’. This shift signalled a move away from talk of breaking up public healthcare (remember, Lansley’s top-down reforms were a “reorganisation so big you can see it from outer space”) towards a language of “collaboration” into which the term “integration” fits neatly. The truth is there is no real or meaningful local accountability with ACOs: no one knows what will happen if private contractors walk away from their contracts, or if they choose to close services and sell off buildings in search of more lucrative ventures, as has been happening recently with nursing home closures. Sometimes the conversation around the protection and the future of the NHS can seem hopelessly bleak. But, although the task can appear insurmountable, there are groups working to combat the corporate divvy-up of UK public healthcare. And they require public support now more than ever before. This judicial review action, for instance, has already prevented swathes of ACOs from being rubber-stamped until the case and consultation reaches a conclusion – they had initially been scheduled to come into effect this April. The case obviously can only go so far, though, due to its necessarily limited remit besides other things. Beyond other standalone legal battles like it, what has so far been stripped away can only be rehabilitated and restored by an Act of Parliament – which is why it is essential to support the Private Members’ Bill on 11th July to reclaim and begin to re-instate the NHS.